The Chinese were among the very first star gazers to accurately record their observations with historical records existing from at least the time of the Warring States (475-221 BC). As with other ancient cultures, there has always been a very close relationship between human events on earth and grand movements of the heavens. The astronomical features on the Chinese coin displayed at the left are based in part on a poem from the "Book of Songs" (Shi Jing 诗经), also known as the "Book of Odes" or "Classic of Poetry", which is an anthology of ancient Chinese poetry compiled by Confucius (551-479 BC). The poem, entitled the "Great East" (诗经·小雅·大东), alludes to the "Winnowing Basket" (Sagittarius) and the "Ladle" (Big Dipper). 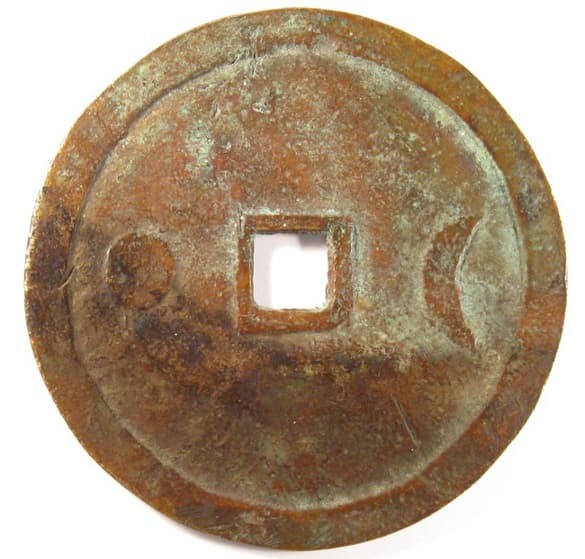 The coin also displays the stars associated with the very popular Chinese myth of the "Cowherd" and the "Weaving Girl". Since ancient times, Chinese astronomers have divided the heavens into four regions identifed with the directions East, South, West and North. Each of the four regions is defined by a mystical animal and these animals are variously known as the "Four Divine Creatures", the "Four Heraldic Animals", the "Four Directional Animals" and the "Four Symbols" (si xiang 四象). These regions are the Azure Dragon (qinglong 青龙) of the East, the Vermillion Bird (zhuque 朱雀) of the South, the White Tiger (baihu 白虎) of the West, and the Black Tortoise (xuanwu 玄武) of the North. Each of the four regions is divided into seven "mansions" (xiu 宿) making a total of twenty-eight mansions (er shi ba xiu 二十八宿). The mansions refer to the position of the moon as it moves across the field of stars. The Chinese astronomical coin discussed below includes two of these star constellation "mansions". One is the "Net" indicated by the Chinese character 畢 (bi) written at the far left end of the "Milky Way". The other "mansion" is the "Winnowing Basket" indicated by the Chinese character 萁 (ji) written at about the two o'clock position on the coin. The coin also alludes to the ancient story of the "Cowherd" and the "Weaver Girl". There are several versions of the story but the main plot is as follows. Once upon a time, an ox herder named Niu Lang (牛 郎), which translates as the "Cowherd", discovered seven fairy sisters bathing in a lake. For fun, he secretly took their clothing. Upon discovering their predicament, the sisters decided that the youngest among them, known as Zhi Nü (織 女) or the "Weaver Girl", should go and fetch the clothing from Niu Lang. When the Cow Herd saw the beautiful Weaver Girl in a naked state, he quickly proposed marriage which the Weaver Girl promptly accepted. Their life together was blissful and they had two children. However, when the Weaver Girl's goddess mother discovered that her fairy daughter had married a mortal being, she ordered Zhi Nu to return to the heavens. Of course, the Cowherd was very distraught that his wife had left him. His magical ox then spoke and said that if Niu Lang killed him he could wrap himself in the hide which would then allow him to fly to the heavens to reunite with Zhi Nu. The Cowherd reluctantly followed the advice and killed the ox. Wrapping himself in the hide and holding on to his two children, he flew off to find his wife. Unfortunately, Zhi Nu's mother found out that the Cowherd was on his way and quickly took one of her hairpins which she then used to scratch a "river" (the Milky Way) in the sky to prevent the Cowherd from reuniting with her daughter. The story does not end in complete disappointment, though. Once a year, on the 7th night of the 7th month of the Chinese lunar calendar known as the Qixi Festival (qi xi jie 七夕节) or the Magpie Festival, all the magpies on Earth fly to the heavens and form a bridge across the stars which the two lovers may then cross to spend a night together. In Chinese astronomy, there is a star named the "Cowherd" and another named the "Weaver Girl." These two stars are included on the coin to be discussed below. 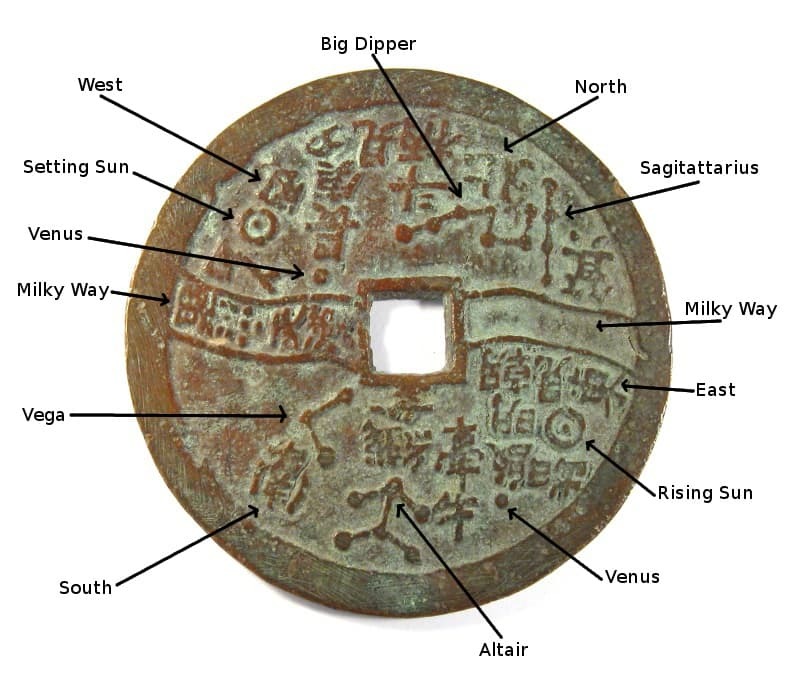 The Chinese coin at the left depicts some of the major stars, star constellations and other astronomical objects particular to Chinese astronomy. The coin has a few guideposts as follows. 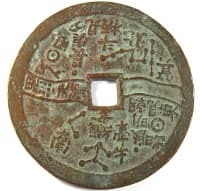 The double line running across the middle of the coin is the tian han (天漢) or what is known in the West as the "Milky Way". The Chinese also use the term "Silver River" (yin he xi 銀河系) to describe this astronomical phenomenon. 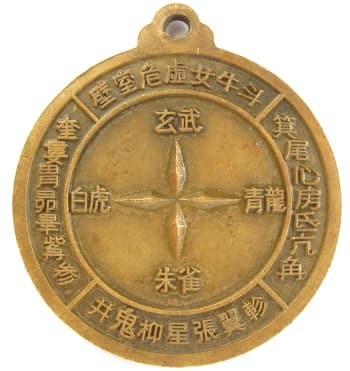 The coin is also labeled with the four cardinal directions, namely North (bei 北), East (dong 東), South (nan 南), and West (xi 西). Starting with the "Milky Way" at the left of the coin and moving clockwise toward the "North" is Venus or what the Chinese generally call the "Gold Star" (jin xing 金星) or "Great White Star" (tai bai xing 太白星). However, the Chinese have different terms to refer to Venus depending on its position in the sky. When seen in the Western sky during the months of November and December, Venus is called "chang geng xi jian" (長庚夕見) which are the Chinese characters written on this coin. Continuing clockwise, the next astronomical body is the Sun (ri 日) depicted here as a circle with a dot in the middle. Next is the "Ladle" ("Plough") (bei dou xing 北斗星) or "Big Dipper" represented by the seven stars (dots) connected by the zigzag line and labeled with the Chinese characters 斗柄 (dou bing) meaning the handle of the Dipper. Just to the right of the "Big Dipper" is a constellation composed of four stars (dots) connected by a straight line which is the "Winnowing Basket" (ji 萁), known in the West as Sagittarius, and which is one of the eastern mansions of the Azure Dragon. Beginning with the Chinese character for "East" (dong 東), which is just below the "Milky Way" at about the three o'clock position, and continuing in a clockwise direction toward "South" (nan 南) which is at the seven o'clock position, there is the "Rising Sun" (ri 日) again depicted here as a circle with a dot in the middle. Next is Venus which is labeled with the Chinese characters 启明見朝 (qi ming jian zhao) meaning to see the daybreak. This is because during the months of March and April Venus is seen in the East as the "morning star" (chen xing 晨星). Next is a six star constellation which resembles a man or an arrow. The star at the apex or "head" is the "Cowherd" star (qian niu 牽牛), better known in the West as Altair. There are two stars, one on each side of Altair, which are the Cowherd's children. The coin shows these three stars connected together, along with three other stars, which seems to form a stick figure of a man running. This symbolizes the Cowherd chasing across the heavens after his wife, the Weaver Girl. Just above the Chinese character for "South" (nan 南) is the three star constellation which includes the "Girl Weaver" star (zhi nu 織女) known in the West as Vega. Located within the "Milky Way" to the far left and labeled as 畢 (bi) is an eight star constellation the Chinese call the "Net" and which is known in the West as Taurus (Hyades). The "Net Mansion" (bi xiu 畢宿) is one of the western mansions of the White Tiger. The reverse side of the coin only has two symbols. To the right of the square hole is a crescent moon (yue 月). A star (xing 星) is displayed to the left of the hole. This coin has a diameter of 79 mm and a thickness of 3.5 mm. Please also visit my blog for information on an old Chinese Star Charm.